Reading about the adventures of Violet is like eating a box of chocolates. It’s a sumptuous read – in part I kept wanting to stroke the cover, which I have in hardback, as it is shiny and has Becka Moor’s divine colour illustrations on the front. The best thing though is that its luxurious feel is replicated in the words within. Our heroine, Violet, is a young Sherlock Holmes, solving mysteries where she can. In Hidden Treasure, she has just returned from a holiday in India, when she is asked to look after the Maharajah’s cockatoo, as sadly the Maharjah has died and the cockatoo is the only link left to his fortune. Someone is trying to birdnap the cockatoo, and it is up to Violet and her friends to figure out who it is. Harriet Whitehorn draws a picture of an eccentric family living with somewhat eccentric neighbours around a communal garden. The whole book has a timeless feel, although there are allusions to modern day, but what makes it notable is the beautiful language that Harriet deploys to tell her story. The plot is a fairly run of the mill mystery – perfect for the age group, if a little contrived for a grown up reader, but the luxury of the book makes it rather special. I loved the glossary of Violet’s ‘tricky’ words at the back, which is a fun way of introducing good vocabulary to a young reader, as well as the newspaper articles summing up what happened after the story ended. And for me that encapsulates what the Violet series is all about – the fantastic attention to detail. Violet and the Pearl of the Orient, which was the first in the series, is similar in vein, with detailed illustrations matching the detailed text. 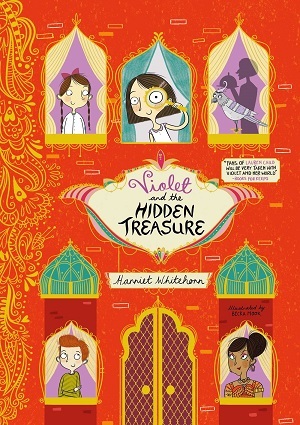 There’s a lot to coo over within these books – I’d take Violet over a Cadbury’s Milk Tray any day. For readers age 7+, this follows in the ilk of Goth Girl and Ottoline – highly illustrated younger fiction which appeals because the books are both well written and beautifully produced. With thanks to Simon and Schuster for a review copy. Buy yours here.